When I first posted about the 76th Foot in June 2014 (see here) I explained how I intended to paint up two units' worth of figures. 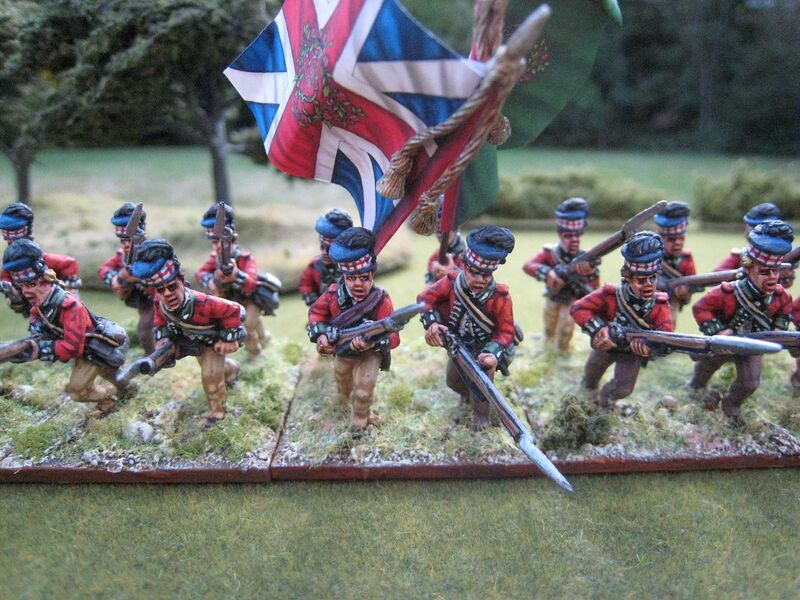 As I explained in that earlier post, in the published "British Grenadier!" scenario books, the 76th appear in two battles: Petersburg (volume 3) and the hypothetical Gloucester Point (volume 2 - a planned but abandoned British break-out attempt from Yorktown). In the Petersburg scenario, the ratio of 1:15 creates a large unit of 32 figures that is divided into two "wings" of 16 figures each. In Gloucester Point, there is just one unit of 24 figures. I decided to paint one "wing" in marching poses and the second "wing" in charging poses, the latter being bulked out to 24 figures to accommodate the Gloucester Point scenario. So here's that second wing. I won't repeat the AWI service history of the 76th Foot, which is set out in my previous post. And needless to say, these are all King's Mountain Miniatures figures. Bill Nevins' extraordinary commitment to this range means that (together with the Perry range) we are now well served for highlanders. In fact it's hard to think of what's missing, except skirmishing flank companies, perhaps. I placed the colours with this "wing", as the relevant figures seemed to me more suited to the charging poses than the marching ones; but you can use them for either. I mixed in a couple of casualty figures - again, these work for any of the three poses that the KMM figures come in (the third being firing line). There isn't a charging officer but there is a charging sergeant figure - I've used two of those in this unit. 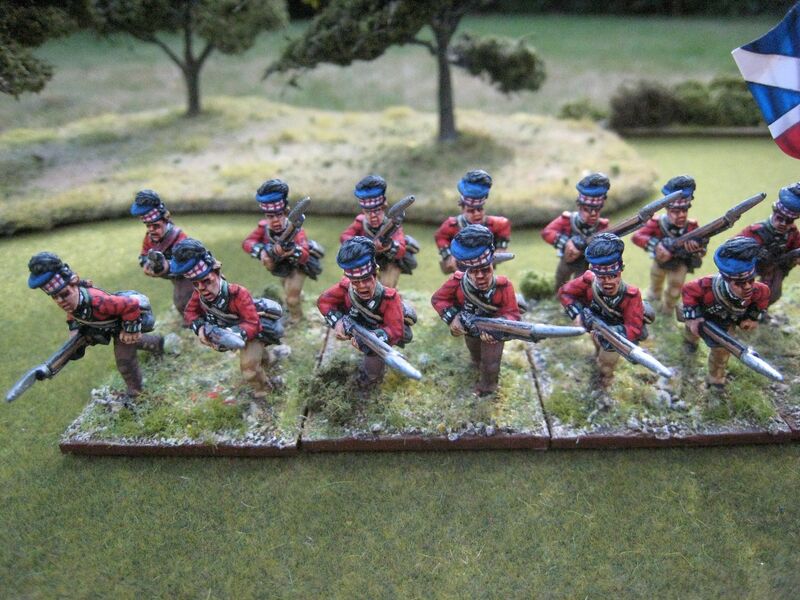 I can't recall why it's taken me so long to post about this second batch of the 76th. I think it took me a good while to get around to ordering the colours from GMB (who then delivered very promptly). 24 figures. Painted January to March 2016. Flags from GMB. I recently took all my highlander figures out of their boxes for a parade. 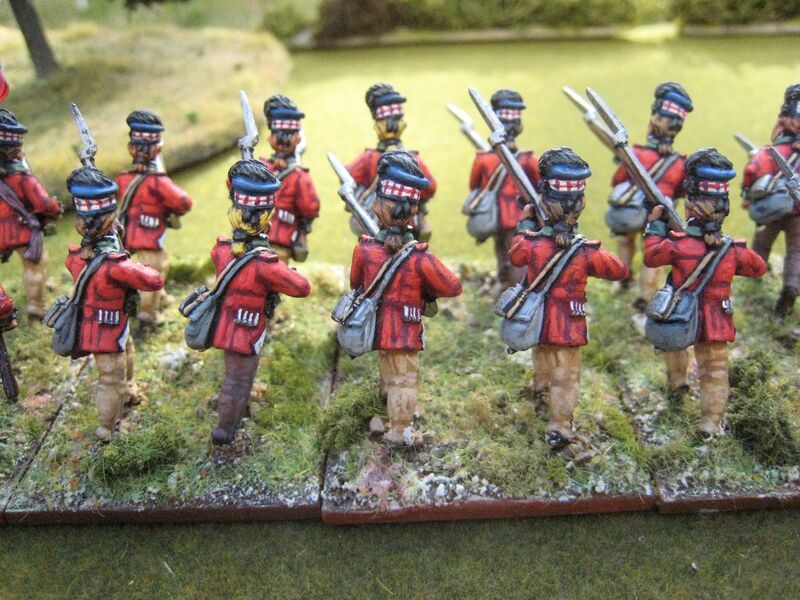 My current tally is this: the 42nd/Black Watch (30 figures); the 84th/Royal Highland Emigrants (18); 3 units of the 71st (18, 18, 24); 2 units of the 76th (16, 24); the "4th combined grenadier battalion" (16); plus 3 mounted officers and 4 casualty figures. 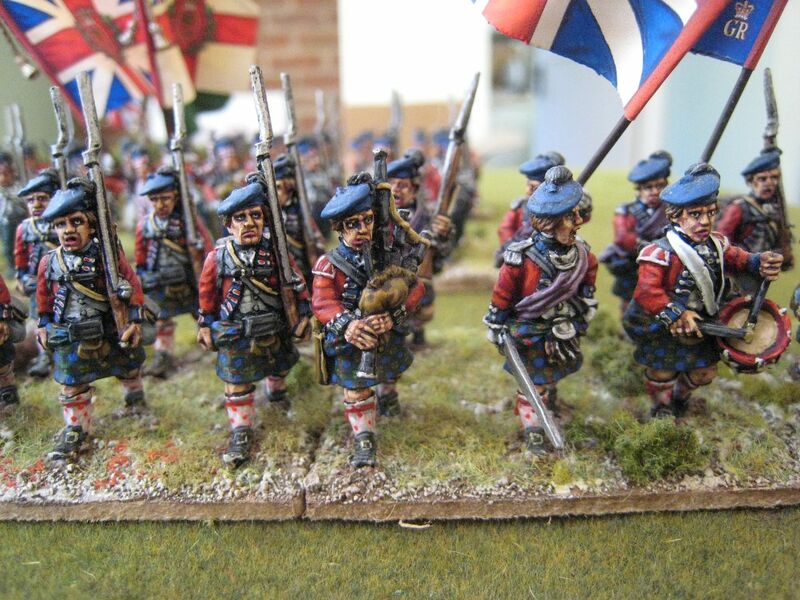 That's 171 highlanders in total (in fact it's 172 if you include the highlander mini-me in the Perry interrogation pack, and I haven't included any of the generals who happened to be Scottish), of which around 115 are wearing some sort of tartan. 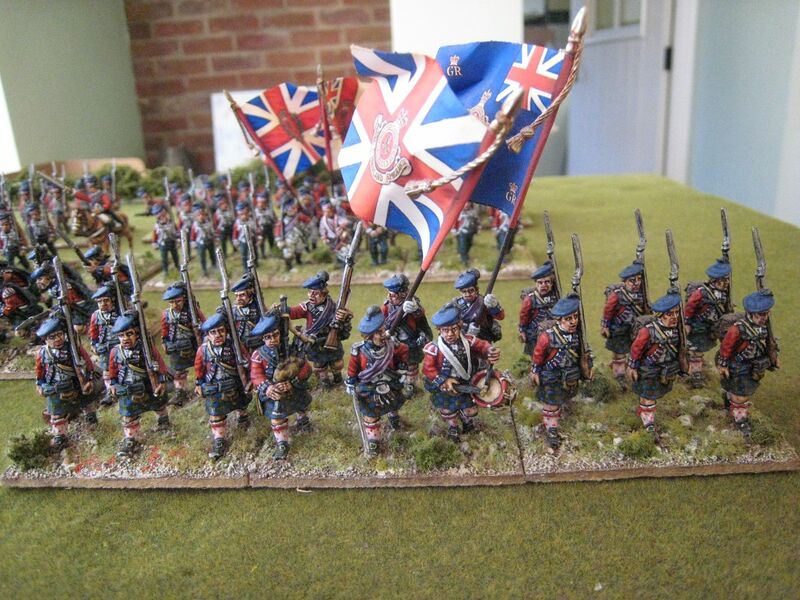 And I've painted 50-odd highlanders for Bill too. 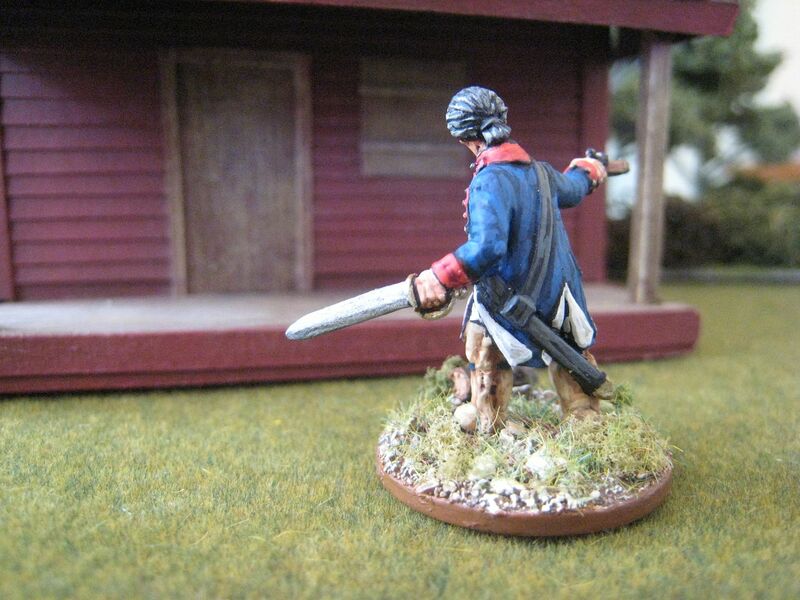 I'm not quite finished - I need a unit of 71st Foot skirmishers for Gloucester Point, and in theory a 16-figure unit of light companies for Briar Creek, but I'll probably give the latter a miss. 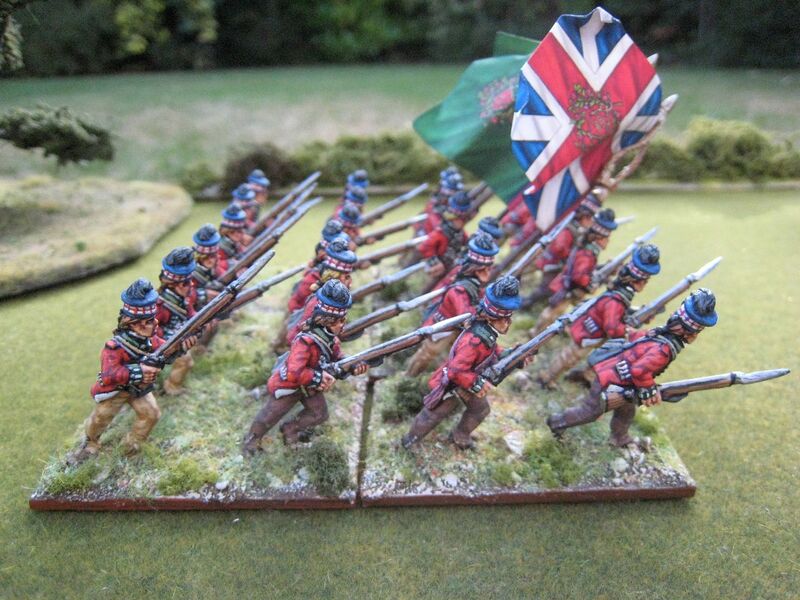 Here are a few photos of my collected Jocks (although without the grenadier battalion). I'm intending to write posts about the three mounted officers shortly. John Butler (1728–1796) lived in the Mohawk Valley from his early teens and became highly proficient in the local Indian languages. This led to his employment as an officer in the Indian Department during the French & Indian War. After the war he became a substantial landowner and retained close links to the Indian Department. He also became a lieutenant-colonel in the Tryon County Militia (of which Nicholas Herkimer was Brigadier-General) but when the AWI broke out he remained loyal to Britain and moved to Canada. He helped mobilise up-state New York's Indians to support the Saratoga campaign and Butler participated in the battle of Oriskany. He was then promoted lieutenant-colonel for a second time and given authority to raise his own regiment. 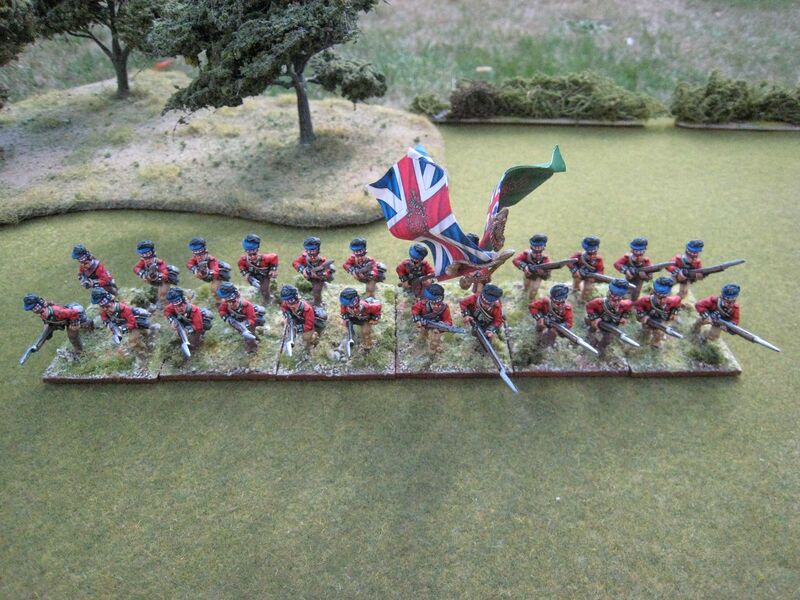 This unit became known as Butler's Rangers and ultimately comprised ten companies of around 60 men each. But you will not by any means listen to any overture of peace before the total ruinment of their settlements is effected. Our future security will be in their inability to injure us and in the terror with which the severity of the chastisement they receive will inspire them." The Sullivan Expedition made good progress in the achievement of those objectives, but failed to land a "killer blow". As a consequence, Iroquois raids continued, but the Indians were a much depleted, and dispersed, force. The largest battle of the Expedition was at Newtown on 29 August 1779. The Indians and Loyalists, a force which included Butler's Rangers, positioned themselves in earthworks, but Sullivan's clever flanking attacks, vigorous fighting by the 2nd and 3rd New Hampshire Regiments and the Americans' artillery won the day. The regiment disbanded in June 1784 and its soldiers appear to have settled in Ontario. A few years later Butler formed his veterans into a local militia which, under the name of the Lincoln Militia, fought in the War of 1812. John Butler did not live to see that further conflict between the US and Great Britain. He died in 1796, a prominent political leader of Upper Canada. There's a much more detailed history of the regiment by Calvin Arnt here. 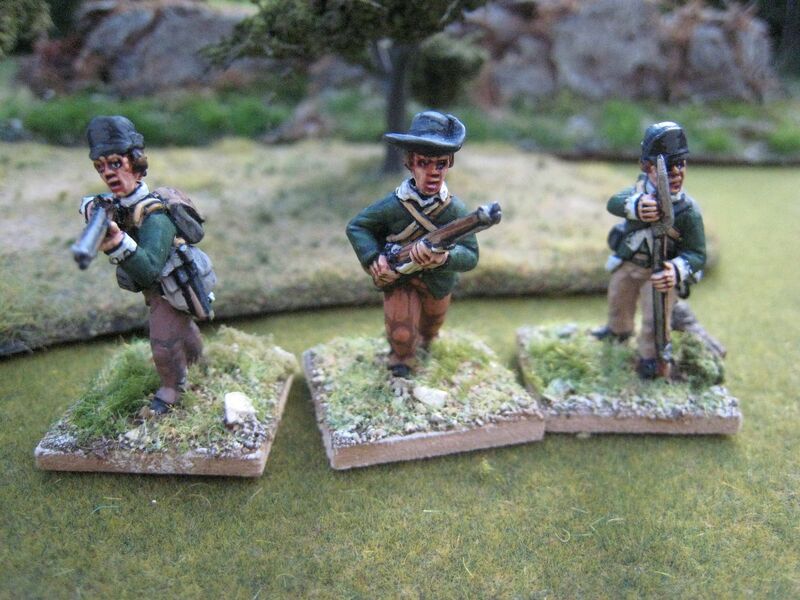 I've designated these figures as "Butler's Rangers", but to be honest it's designed for use as generic Loyalist rangers in scenarios which call for such, like Oriskany, the Saratoga battles and Savannah, to give just 3 examples. 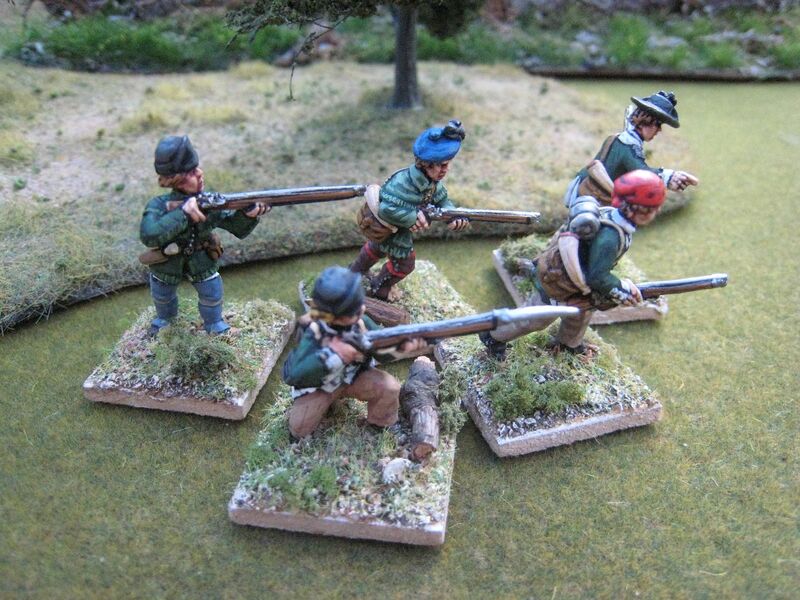 The figures are King's Mountain Miniatures' Continentals with a variety of heads. I wanted the unit to have a high degree of uniformity but still have the look of some modifications for the field. Both the McGregor/Mollo and Smith/Kiley uniform books show Butler's Rangers in dark green hunting shirts, so I made up a couple of figures in that dress. 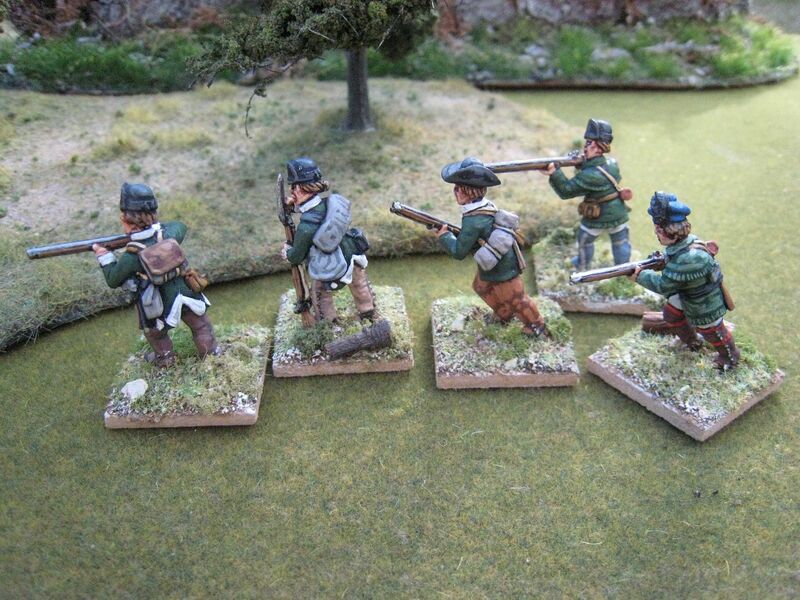 Otherwise, I've modelled these figures according to this online article by Calvin Arnt. Most portrayals show the Rangers in dark green coats with red facings, and leather caps with a brass front. Arnt argues that the facings were most likely to have been white, not red. I'll not explain his reasoning here - the article in the link does so at length. As for headgear, Arnt doesn't like "jockey caps" and argues that the Rangers probably wore slouch/round hats and perhaps tricornes for the NCOs and officers. I decided, however, that I wanted to have a couple of figures in caps and so I used a variety of KMM heads. The caps here are KMM 10 but with the peak cut/shaved off. I didn't use brass-fronted caps because I've always been a bit suspicious of whether people who spent a lot of time sneaking around would wear something that would catch the sunlight. 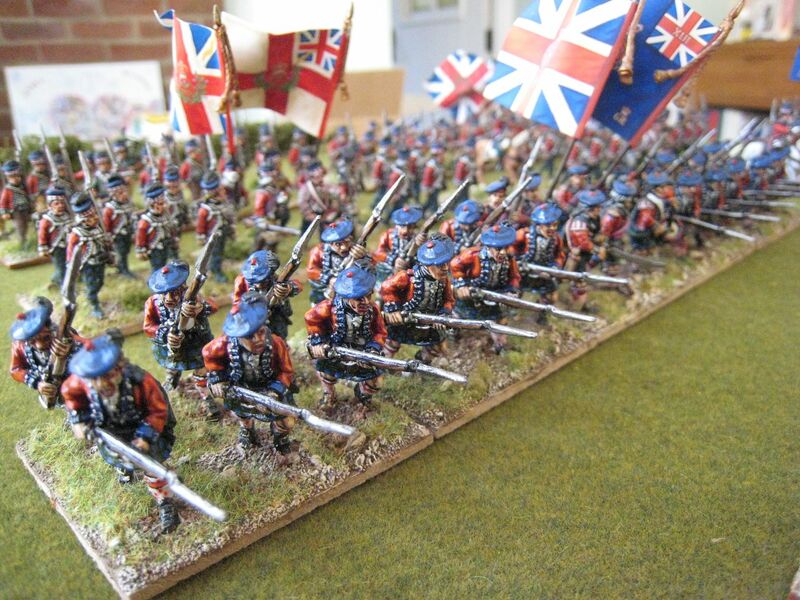 No doubt others object to Arnt's conclusions by I would emphasise that these are intended more for use as generic Loyalists (the "British Grenadier!" 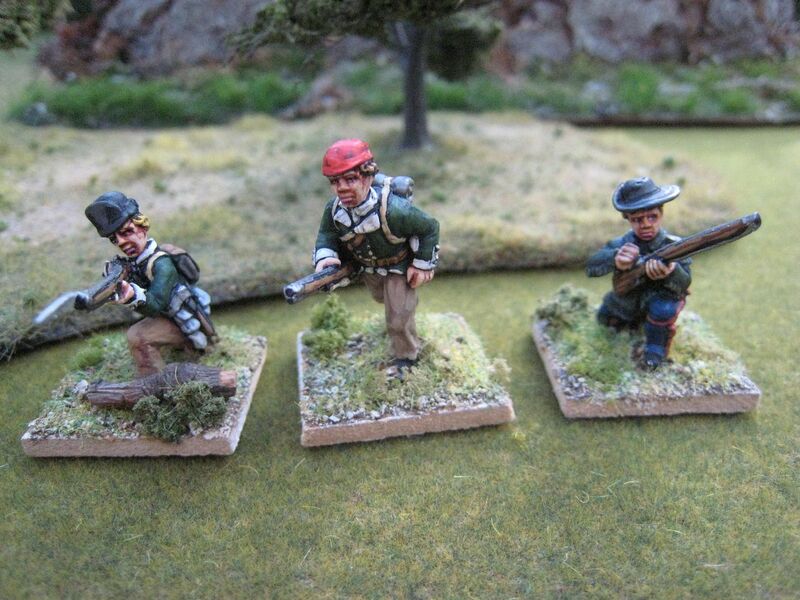 scenario for Oriskany, for example, requires 6 "rangers" in Butler's brigade - that unit can't be "Butler's Rangers" as the regiment didn't exist until later; but I'll use these figures). The two figures in hunting shirts could also be used as Patriots. 9 figures. Painted September 2016. Nicholas Herkimer was born in 1728 (or thereabouts), the son of German immigrants. His family lived in the German Flatts area of upstate New York, in the Mohawk Valley. Herkimer saw action in the French attack on German Flatts in November 1757. The following year he was promoted to captain in the local militia. 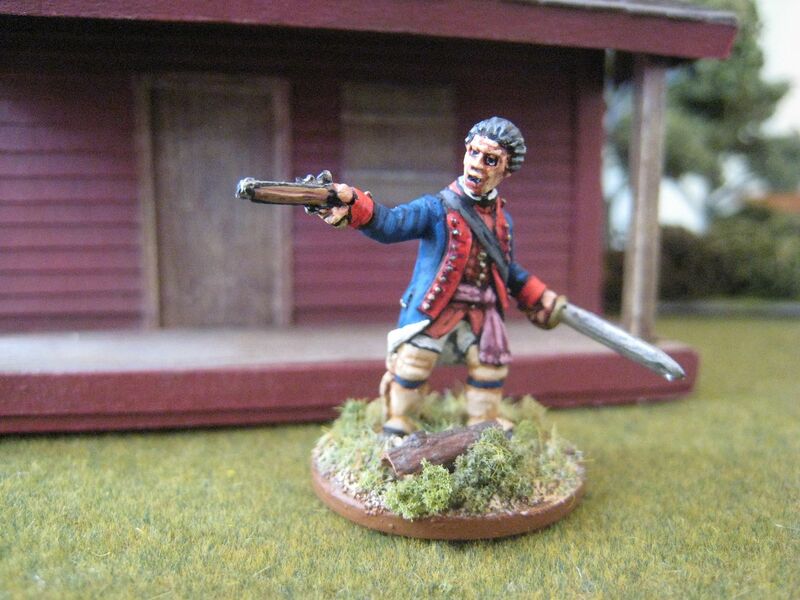 By the time war broke out in 1775, Herkimer was a militia colonel. In June 1776 he led a small forced to see the Mohawk leader Joseph Brandt, in an attempt to persuade Brandt to remain neutral in the war with Britain. Brandt refused, and remained loyal to the Crown for the duration of the war. 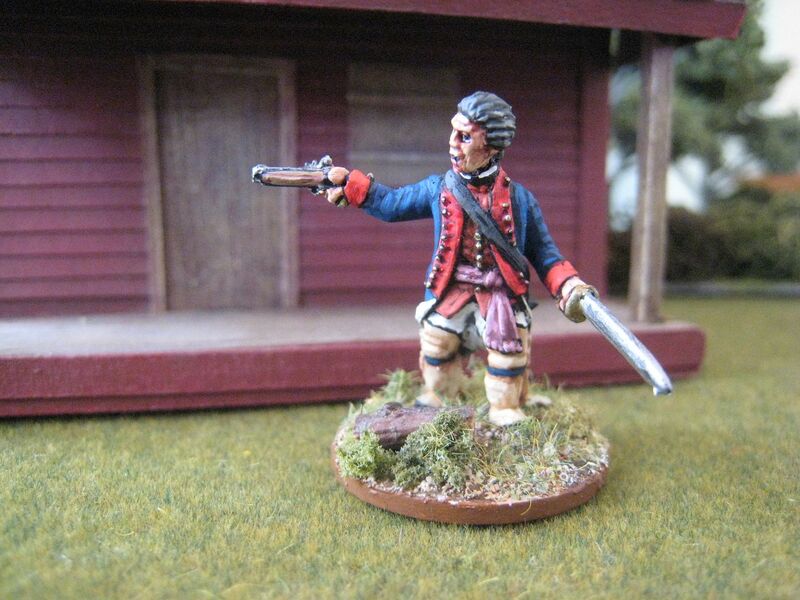 By September 1776 Herkimer had been made a brigadier general in the Tryon County militia. In August 1777 British troops laid siege to Fort Stanwix (on the site of modern Rome, New York) and Herkimer ordered the local militia to form a relief column. There is some suggestion that Herkimer wanted to wait but was stung into action by his junior officers, who had used the fact that Herkimer's brother was a Loyalist officer to question Herkimer's motives. 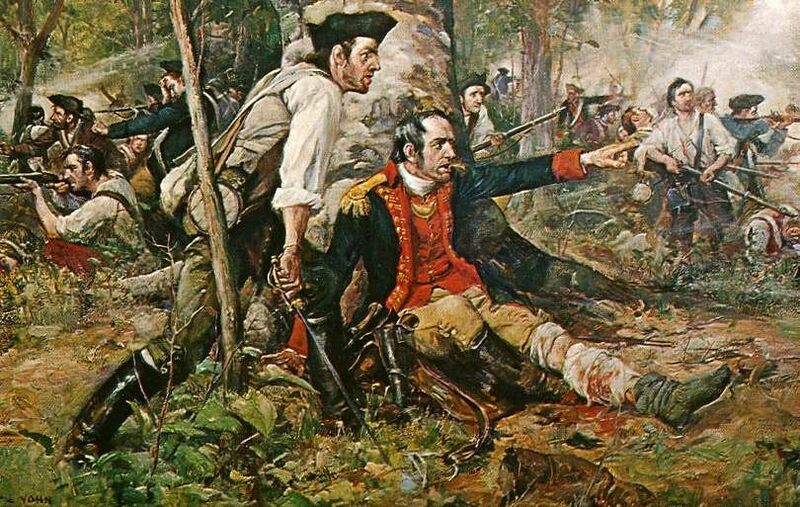 The militia set off and on 6 August Herkimer's column was ambushed in a ravine by a mixed force of Loyalists, jaeger from Hanau and Mohawks under Brandt's command. Shortly after the ambush began Herkimer's horse was shot and he himself was badly wounded in the leg. He propped himself up against a tree and continued to direct the battle as best as he could. The Indians had sprung the trap too early and the rear elements of Herkimer's column fled. Those who remained faced what must have been a horrific hand-to-hand battle. 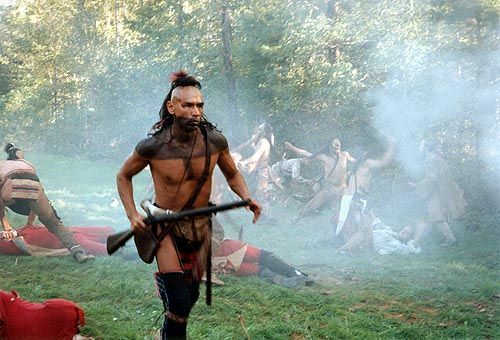 A common tactic of the Indians was to wait for the flash of a musket before rushing to attack with hand-held weapons before the firer had time to re-load. 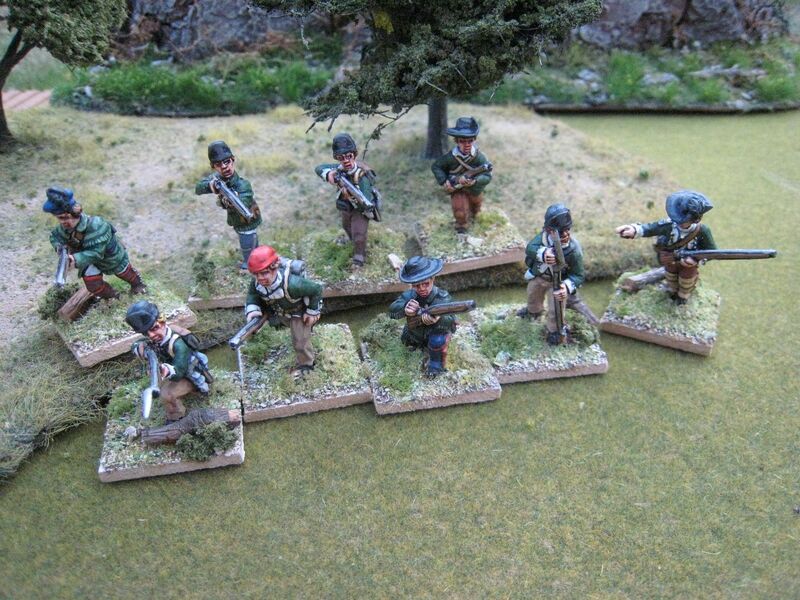 However, the Americans were able to rally and fight their way back down the ravine to higher ground. Herkimer was able to organise a more effective and co-ordinated withdrawal and the remains of his force were able to disengage and retreat back to Fort Dayton. The battle was very cost for the American side, which lost approximately 450 casualties against 150 dead and wounded Loyalists and Indians. Herkimer's wound was attended to, but his leg because infected and the decision to amputate was taken too late. The operation took place 10 days after the battle and was not successful. Herkimer died on 16 August, aged 49. 1 figure. Painted September 2016. This is the first Indian/Native American figure that I've painted in 6 years. 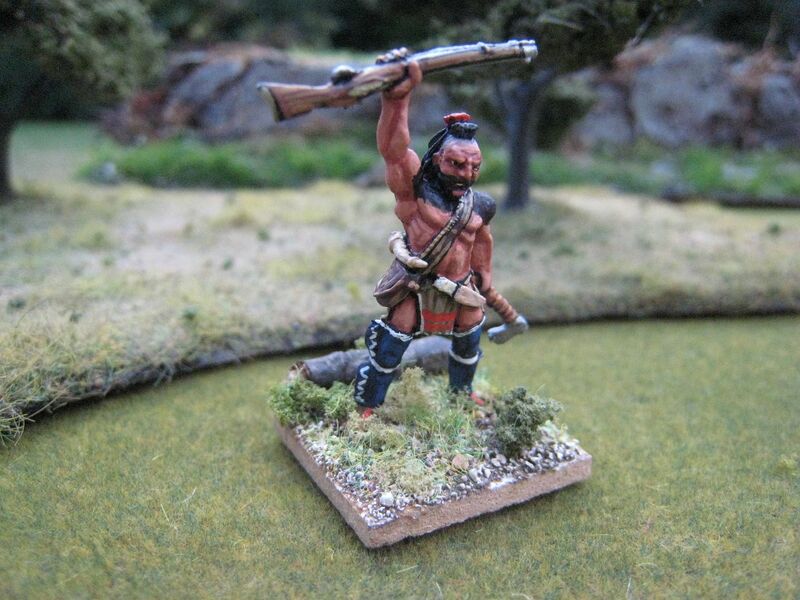 I painted a horde of Conquest Miniatures Iroquois back in 2006 (see here) and then more Conquest and Perry figures over the course of 2006/2007. I finished off the figures in the Perry range in 2009 (see here) and added the Conquest figures of Tecumseh and Tenskwatawa in 2010. That gave me about 60 foot figures, with 3 mounted and a pack of civilians. 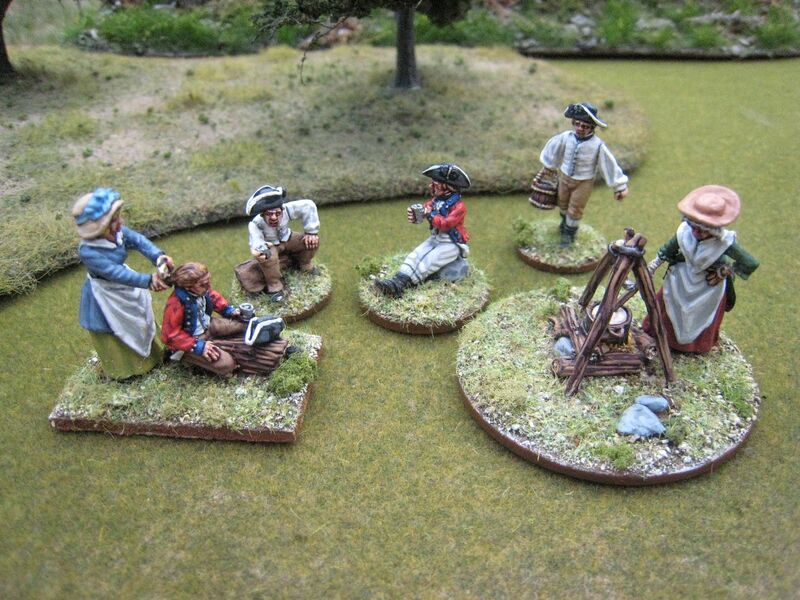 That's more than enough for most AWI needs, other than Oriskany (for which you need a lot of Indians - I'll run through the "British Grenadier!" 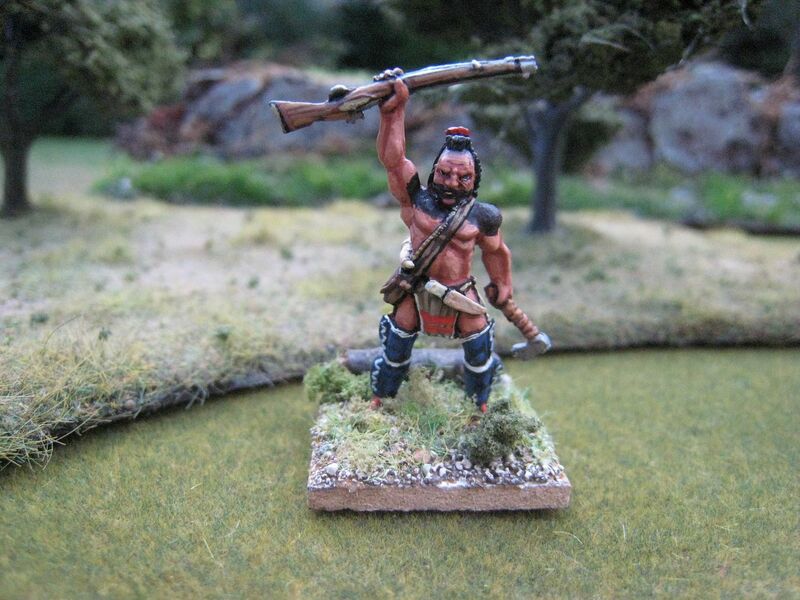 scenario requirements for Indians when I next paint up a pack of Conquest figures). 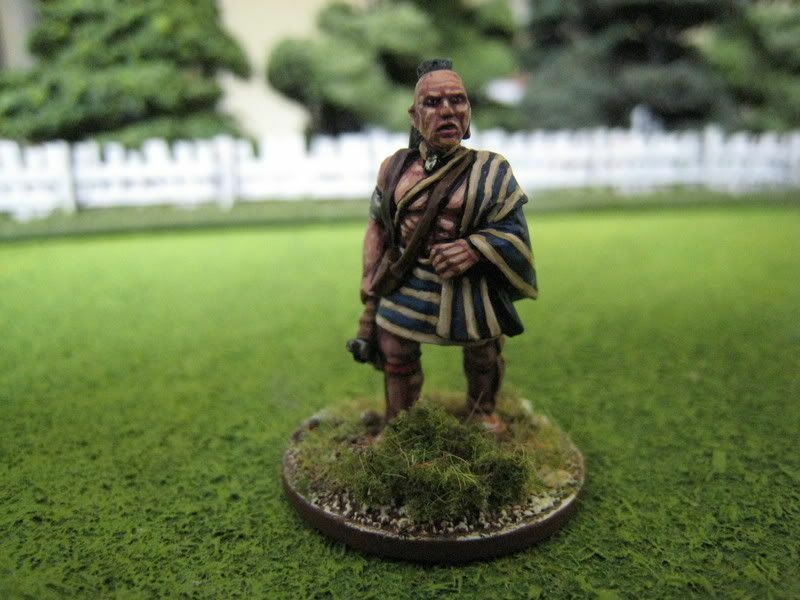 I can't recall when or where I picked up this Conquest Miniatures version of Magua, as potrayed by Wes Studi in "Last of the Mohicans", but he'd been on the painting desk half-painted for a while and I finally finished him off when I was painting the loyalist camp I posted about earlier. Conquest do two Magua figures. 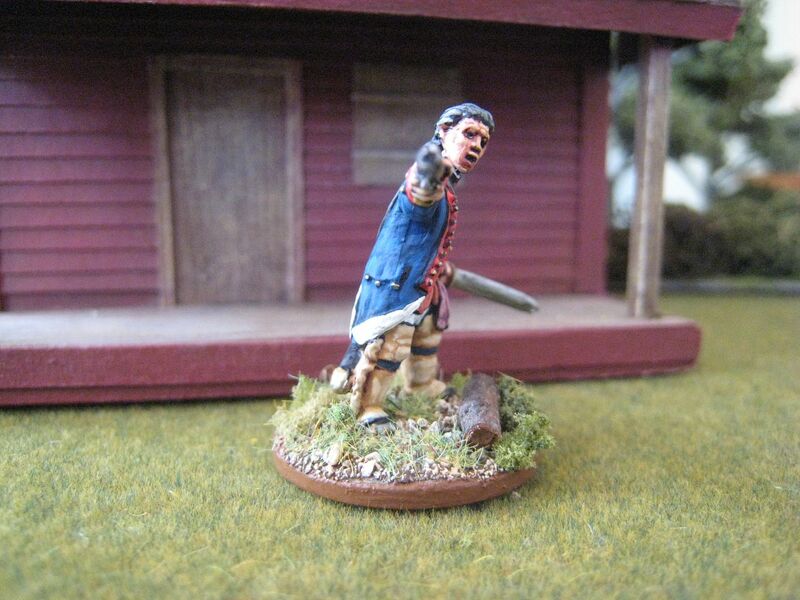 The first is from a pack of "Last of the Mohicans" characters, and shows Magua in the outfit he wore when leading a British column, with Colonel Munro's daughters, into an ambush. A photo of that figure is below for comparison (and the relevant blog post is here). The second figure shows Magua celebrating his slaughter of Munro and other British troops after they leave Fort William Henry. I started painting this figure as a generic Indian before I realised that there was no excuse for not painting Magua as he appears in the film (see above). For the flesh I used Foundry's "Native American Flesh" 120 palette, which I'd previously tried out on the figures of Tecumseh and his brother. Before that I had used my standard flesh palette, and this produced figures with rather "white" skin. The colours of the clothing and equipment are not 100% accurate when compared to the photo of Wes Studi, but I think the overall effect is pretty similar. I perhaps could have done with a bit more black paint on the right upper arm. The black zig-zags are on his head, but are difficult to see in the photos, and I tried to add that shaven-headed look with a thin grey wash. 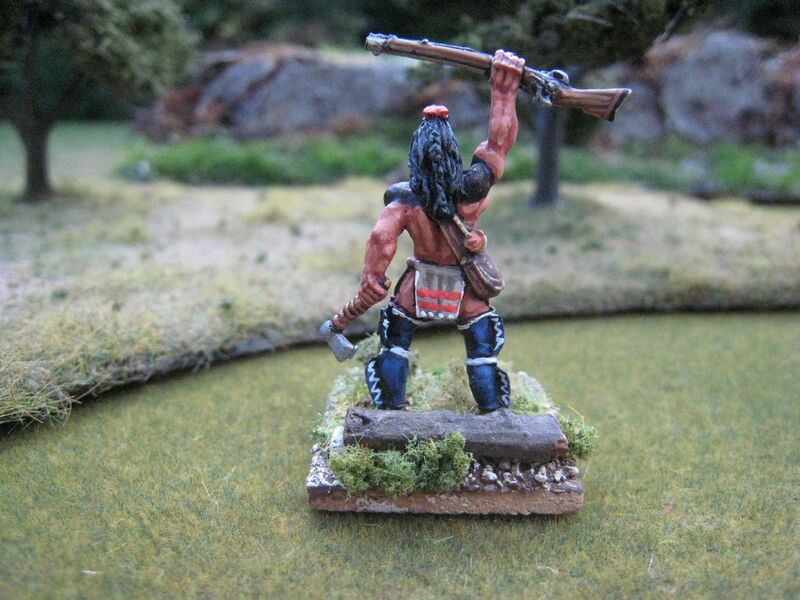 I base chieftains on 2 pence pieces and "rank and file" on square bases, so it's easier to tell who's who in games. Magua perhaps deserves to be based as a chief, but I have enough of those (and indeed my other Magua is based that way) so he's just another brave. I regret that posts have been thin on the ground over the past couple of months. However, that can be remedied as a result of a good session in the garden with my camera yesterday. 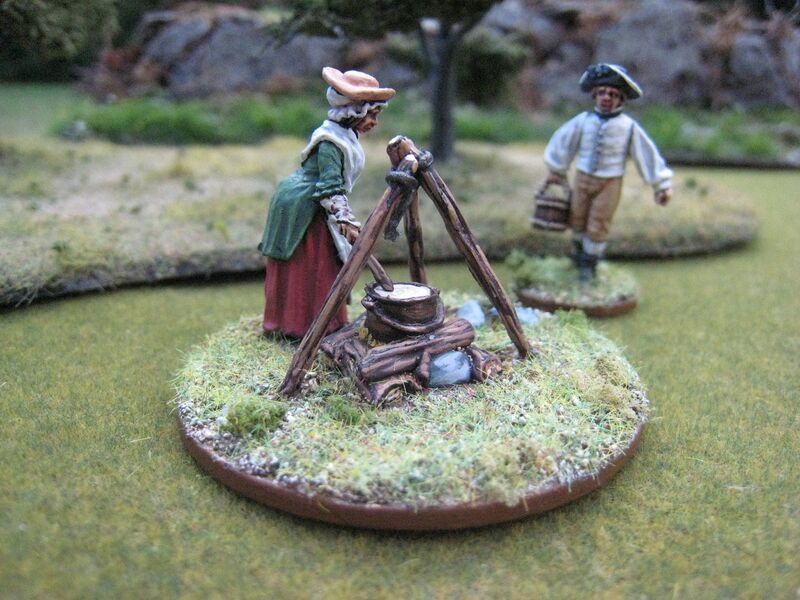 Highlanders, loyalist rangers and some personalities are to come, but to start with here's the Perry Miniatures AWI camp set. The website states that the set can be used for either side. You have two soldiers in shirtsleeves and waistcoats, and two wearing uniform coats; so the latter figures require a decision on what "side" they are going to be. 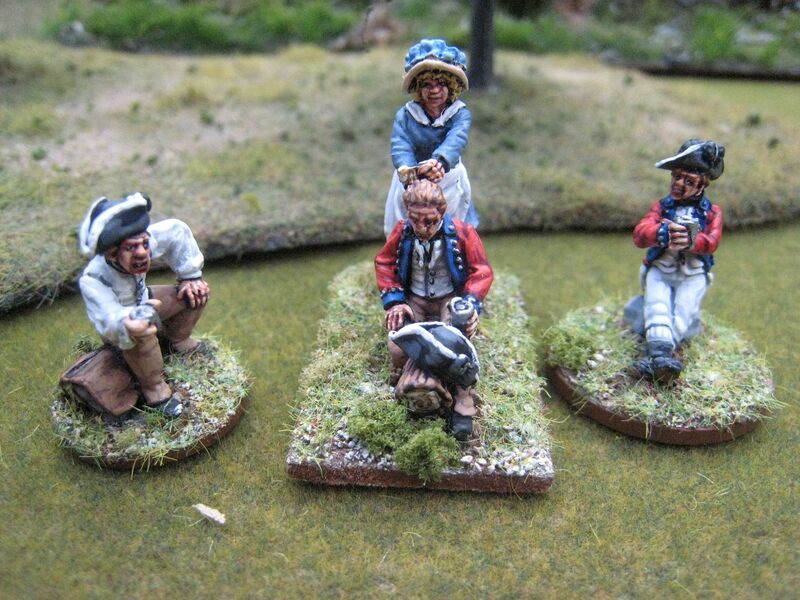 To my eyes this set lends itself more to the British side than the Continental, and I decided to paint the uniformed figures as later-war loyalists. 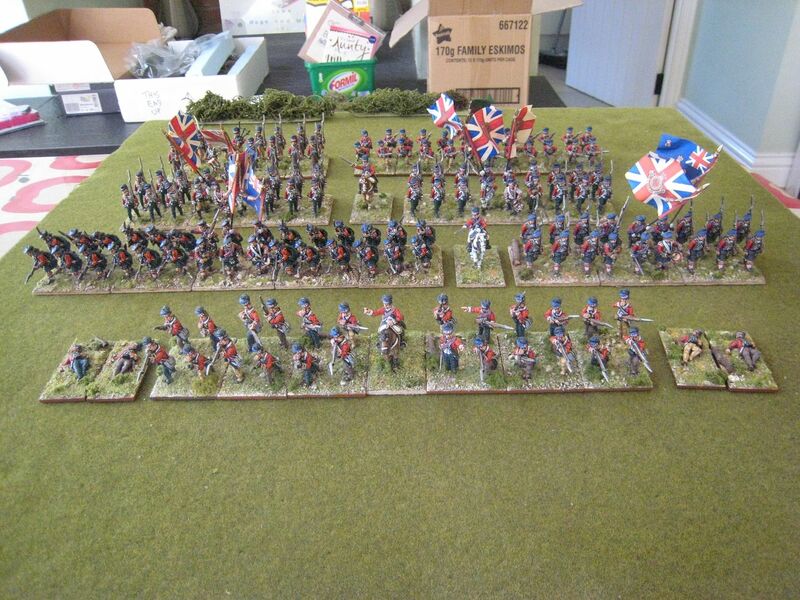 I was thinking in particular of the New York Volunteers that I painted at the end of last year. That's because the only scenarios I can think of which feature Crown troops fighting inside or near their camp are Stono Ferry, Savannah and Eutaw Springs; and all those feature loyalist units clothed in red faced dark blue coats. The colour of whatever's in the pot gave me pause - I've assumed that it's some sort of soup using vegetables, potatoes, chicken and stuff, and that the overall colour of the watery result would be a pale brown. This is a nice little set, one of the small number of packs I bought at Salute this year. 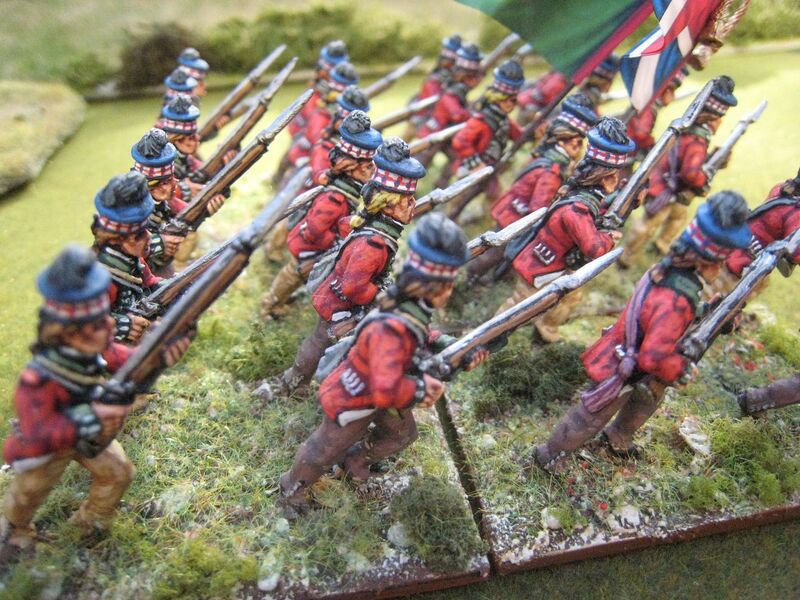 On the workbench at the moment are a large Pennsylvania regiment, the Volunteers of Ireland and some Conquest Miniatures "frontiersmen" which I intend to use for generic Patriot scouts/rangers. 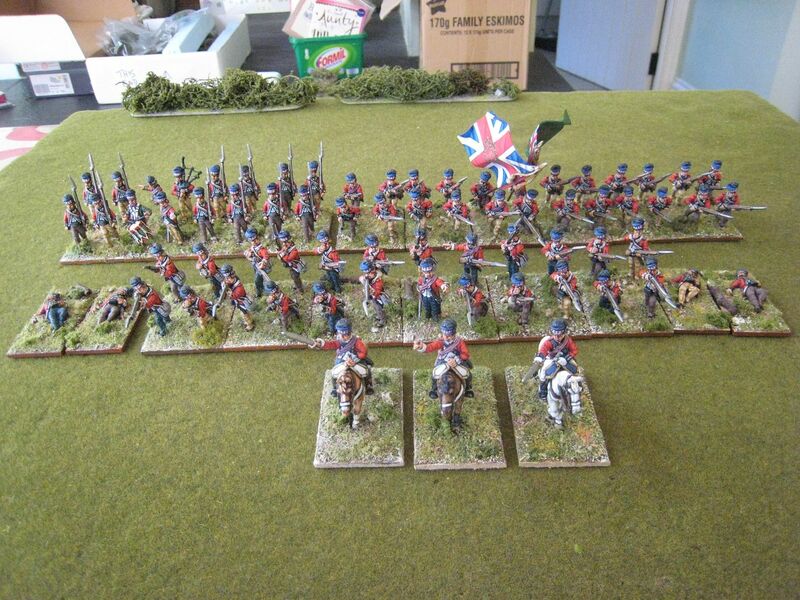 I have a couple of packs of Conquest Indians, which I'll turn to next alongside more loyalist infantry.